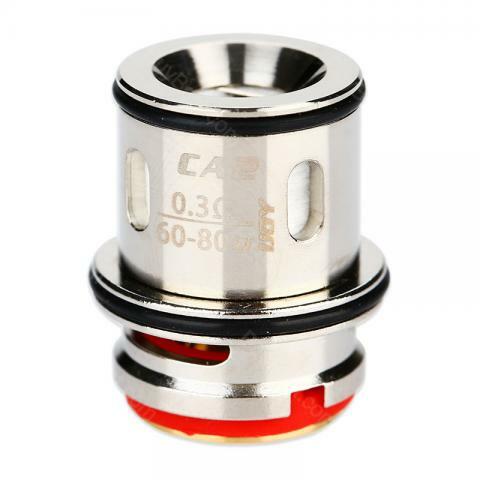 The IJOY CA2 (0.3ohm), CA3 (0.2ohm) and CA8 (0.15ohm) coil are designed for Captain and Captain S Sub Ohm tank. They are more suitable for high VG e-juice. 3pcs each pack. The IJOY CA2 (0.3ohm), CA3 (0.2ohm) and CA8 (0.15ohm) coil are designed for Captain and Captain S Sub Ohm tank. CA2 coil head is composed of kanthal and two SS wires, getting a thicker vapor and more delicate taste. While CA8 coil head is composed of four dual coil combination, increased the intake airflow, can be more quickly evaporate the e-juice, gain a thick cloud vapor. The newly added CA3 is a 0.2ohm coil for 60 - 100W vaping. They are more suitable for high VG e-juice. • Compatible with IJOY Captain Sub Ohm tank and Captain S tank. I like these coils by ijoy and would definitely order more! Got it fast, tasteful and smooth and fits well. It's a good ijoy coil!! It gives a great flavor, just hope it would last longer.